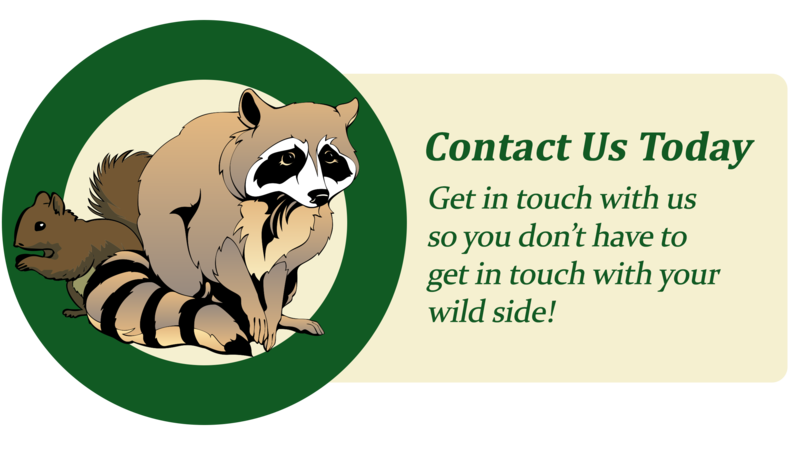 One of the most common calls we get year round is for the common raccoon (Procyon lotor). This species is probably also tied with squirrels for causing the most damage to homes and businesses. Many people are surprised to find that the cute raccoon that they are feeding in their back yard is not the cuddly sweet animal of the Disney movies. He is instead a highly adaptable, extremely powerful, stealthy acrobat (picture a ninja/Schwarzenegger mix). They commonly enter houses by tearing holes in roofs, chewing or tearing through siding, or pulling foundation vents off and entering the crawlspace. The raccoon is now found throughout the U.S. and as far north as southern Alaska. Their southern range extends into Central America where the raccoon gradually gives way to his cousins – the ringtails and coatis. Raccoons have adapted to thrive both in the woods and in the center of urban sprawl. Population densities are now believed to be highest inside city limits and are strongest in some of the largest human population centers such as Chicago, New York, and Los Angeles. Some of these cities (including parts of Knoxville) have a population in excess of several hundred animals per square mile. Diet of the common raccoon is omnivore, meaning they will eat almost any type of fruit, nut, vegetable, or meat. They also thrive on eggs of any animal, small mammals, reptiles, amphibians, and birds. They have been proven to do great agricultural damage to crops such as corn when left unchecked. In the cities they can live well on garbage, vegetable gardens, and pet food. They are nocturnal creatures but can be found wandering around during daylight on some evenings when they are very hungry or sick. This is particularly true of mothers when they are in the final stages of nursing and young when they are first out on their own. The typical litter consists of 2-5 kits and is born in early March. Although the young are typically weaned at about four months, they will stay with their mothers for up to a year. The mother raises the young alone as male raccoons will try to kill the babies. In the wild they have an average life span of 2-4 years, while in captivity they will commonly live 20 years or more. Raccoon rabies is common in in the north, along the Atlantic coast, in Georgia and in North Carolina but has been successfully blocked from gaining a foothold in Tennessee by the USDA. Large baiting programs take place each fall with agents distributing the vaccine in a fish meal by plane, truck, and by hand. This intense program has made raccoon variant rabies rare in TN (one case this year as of October 2012). Of primary concern is raccoon roundworm which is found in their feces. It can be dangerous and even fatal when ingested or inhaled. Raccoons are beautiful creatures, but should be observed without human interaction unless causing damage. They can become nuisances when fed or when they lose their natural fear of humans.